Closed: Thanksgiving, Christmas, New Year's. Admission: Adults-$8; Sr. Citizens-$6.25; College Students-$6.25; and Students 6-17-$5.25; Children under 6 - free. Daily guided tours April through October at 10:45am, 1:00pm and 2:30pm (on Mondays tours begin at 1:00pm). Tours and school groups must contact the tour coordinator well in advance. JGarden Description: Located above the Rose Test Gardens. Public transit available on Tri-Met Bus #63. The Japanese Garden is actually a collection of five gardens of distinctive styles smoothly linked and draped across 5.5 acres of varied terrain. Designed by Professor Takuma Tono in 1963, the garden overlooks Portland and Mount Hood to the east. The Strolling Pond Garden features a naturalistic waterfall and a zigzag bridge weaving through rafts of Japanese irises. The Tea Garden, consisting of inner and outer gardens, contains a teahouse built in Japan with traditional carpentry techniques, as well as a machiai or waiting booth for tea ceremony guests. The Natural Garden meanders down a hillside leading to the Sand and Stone Garden. The path is graced by peaceful nooks and crannies, various kinds of steps and stepping stones, tiny bridges, rivulets and shallow streams. The Sand and Stone Garden, or karesansui, is an abstract composition surrounded by a mud-plastered wall similar in style to those often found at Zen temples in Japan. The Flat Garden, with its raked gravel and moss islands shaped like a sake cup and gourd, is reminiscent of the garden at Sambo-in in Kyoto. The garden can be viewed from a deep-eaved event pavilion built in the Kamakura period style. Dozens of season events are held in the garden, including celebrations of Children�s Day (May), Tanabata (July), Obon (August), Moon viewing (September), as well as tea ceremony demonstrations and camellia, rose, iris, chrysanthemum, bonsai and ikebana shows. Visit the website or call for details. Hamiton, Bruce Taylor. Human Nature: The Japanese Garden of Portland Oregon. 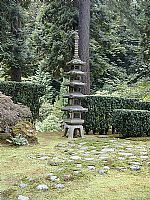 Portland, Ore.: Japanese Garden Society of Oregon, 1996. Japanese Garden Society of Oregon. The Garden Way: The Plan of the Japanese Garden Society of Oregon. Portland, Ore.: Japanese Garden Society of Oregon, 1990. Japanese Garden Society of Oregon. The Plan for a Japanese Garden Society of Oregon. Portland, Ore.: Japanese Garden Society of Oregon, 1965. Japanese Garden Society of Oregon. Symbolism of Lanterns in the Japanese Garden. Portland, Ore.: Japanese Garden Society of Oregon, 1997. "Japanese Gardens Dressed in Best for Easter Sunday." The Sunday Oregonian. April 14, 1968, p 3. Jordan, Barbara. "Hilltop Garden Shows Beauty of Japanese Landscaping." The Sunday Oregonian, March 28, 1971, D-1.